Finishing college was never in question for Emily Gonzales, according to her parents, Milt and Maggie. “Perseverance” is the word they use admiringly when talking about their daughter. What was up for debate was what kind of degree she would get, and where would she get it. That is, until Emily came to Landmark College. “The structure at Landmark, the personal assistance, and the way the school is set up to appeal to every individual’s learning style just made it such a wonderful experience for Emily as a student, and certainly for us as her parents,” said Milt. Emily’s parents had been aware of her learning difference since kindergarten, and worked with the various schools she attended to get Individual Education Plans and other support she needed to graduate from high school. Emily struggled at the college level, despite trying a number of different programs at several schools nearby her family’s New Jersey home. Eager to help her daughter find her path, Maggie’s research led her to visit Landmark College for a session about Executive Function, which she recalled being revelatory in light of the challenges Emily faced. Maggie then brought her daughter to Landmark for a visit. 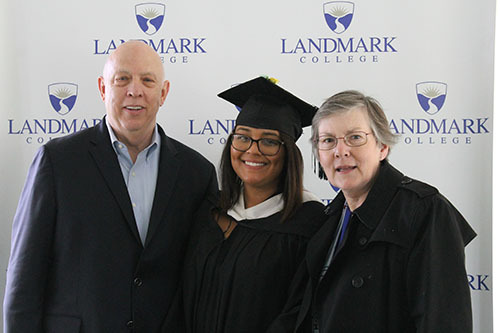 Emily earned an Associate Degree in Liberal Studies and then remained at Landmark College to complete her bachelor’s degree in the spring of 2018. She lives in a house off-campus and was an intern at the local elementary school. Her mother says that Emily may consider a career in teaching following graduation. The Gonzales family says they made a gift to Landmark College out of gratitude for the scholarship and loan support Emily received. “We’re big believers in education and we support many colleges and universities where we have gone or where our children have gone,” said Maggie.